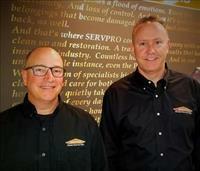 Restoration leaders Randy Miller and Mike Snyder add SERVPRO® of Midland / Gladwin Counties to list of growing franchises. Midland, MI February, 2019-- Randy Miller and Mike Snyder, owners of SERVPRO® of Saginaw, SERVPRO® of Bay City, SERVPRO® of Romulus/Taylor, SERVPRO® of Downriver and SERVPRO® of Westland/West Garden City, have taken ownership of SERVPRO® of Midland / Gladwin Counties. Starting in 1996, Randy Miller was an early pioneer to the mid-Michigan area SERVPRO® system. Since then, the franchise system has grown to over 1800 individually owned and operated franchises. Originally, Randy started in Genesee County and expanded into Saginaw in 1997. Mike Snyder joined the company in 2000. Together, Randy and Mike have grown, acquired, and sold multiple territories throughout Michigan. With their headquarters in Saginaw and an office in Romulus, they currently operate licenses in Saginaw, Bay City, Romulus, Taylor, Downriver, Westland, and now Midland / Gladwin counties. Last June at SERVPRO's 49th Annual National Convention, held in Orlando, FL, the two earned top honors from the corporation. The pair were awarded with the Icon Silver Award as the second largest volume franchise out of the 1,800 franchises across the nation. The efforts of Miller and Snyder’s franchises to go above and beyond does not only stand out in the SERVPRO Corporation, it is also reflected in their contributions to the communities that they serve. Both owners agree that it is important to support the communities that have given so much to them over the years. They show their appreciation by giving back through participation and sponsorships in community events. Miller and Snyder look forward to serving Midland and Gladwin Counties. Founded in 1967, the SERVPRO franchise system is a national leader and provider of fire and water cleanup and restoration services and mold mitigation and remediation. SERVPRO's professional services network of more than 1,700 individually owned and operated franchises responds to property damage emergencies ranging from small individual disasters to multi-million dollar large-loss situations. Providing coverage in 48 states, as well as Canada, the SERVPRO system has established relationships with major insurance companies and commercial clients, as well as individual homeowners. All SERVPRO franchises are independently owned and operated.